Bout Recap: Wildfires and Varsity Brawlers Battle it Out in Power Jams! From the first whistle, it was clear to everyone in the Dollhouse that this was going to be an exciting game to watch. The Wildfires pit their precision skating, speed and agility against the powerhouse hits and formidable walls of the Varsity Brawlers. The Wildfires started the night jamming some familiar faces, with Hartlyn!, Nova and Injurina Jolie all taking turns during the first quarter. The Varsity Brawlers jumped out to an early lead and jammer penalties from the Wildfires led to high scoring power-jam opportunities in the first quarter. PuRRfect and P’Leia were both able to take advantage of power-jams for the Brawlers in order to finish the first quarter with a lead of 54-12. The second quarter saw the beginning of a calmer game for the Wildfires, they began to rally and a 13 point jam from team captain, Boo Lala brought San Diego back within striking range of the Brawlers. The second quarter saw strong displays of defense from both teams with the Brawlers focused on hard hits from experienced blockers like STEFCON1, while skaters like Tsunami, Ballistic Bomber and Ryder Hard on San Diego’s defense worked together on holding and slowing opposing jammers. At the half-time break, the score was 89-44 in favor of the Varsity Brawlers. San Diego welcomed back Bam Bam McGee, who played as a substitute for the Varsity Brawlers. Bam Bam began her derby career with the San Diego Derby Dolls before transferring to LA a couple years ago. Bam Bam and Oblivian Westwood led the Brawlers as strong blockers throughout this game. After the half-time break, the game turned into a true test of endurance for both teams. Fast moving packs and strong blocking from both teams meant that the jammers and their offensive blockers were working overtime in order to score points. With some strong assists from Brazen Bull and Psycho Brahe, the Wildfire jammers were able to power through some very tough walls and quickly recycle blockers in order to add points to the board. In the end, however, a combination of out-standing jamming from Jagerbomb, strong blocking and multiple power-jam opportunities all contributed to a win for the Varsity Brawlers. This was a hard fought game on both sides and a nail-biter to the end, the final score of the night was 183 to 98. The Wildfires can be seen next in the upcoming Southwest Showdown (April 18, 2015). 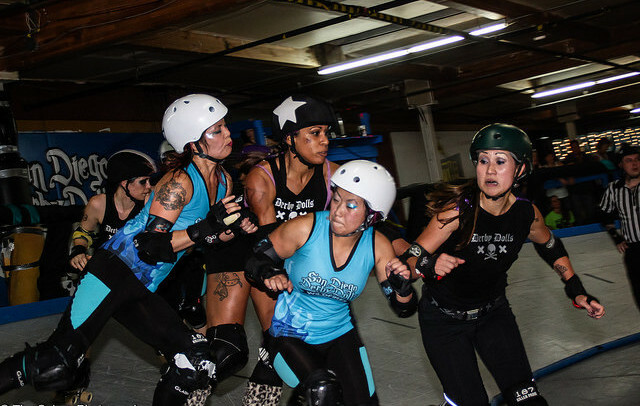 Hosted by the San Diego Derby Dolls, this event will pit two mixed super-teams, made up of all-stars from the Southwest region against each other. Featuring skaters from San Diego’s own Wildfires as well as the Ri-Ettes from LADD and the Hotshots from AZDD, this event is not to be missed!